Inventory of the climate-smart agriculture technologies and practices in Southeast Asia's Climate-Smart Villages. Bonilla-Findji O, Yen BT. 2019. 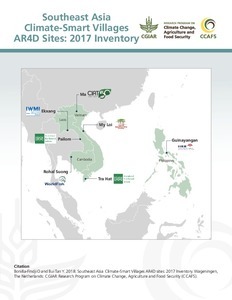 Southeast Asia Climate-Smart Villages AR4D sites: 2017 Inventory. Wageningen, The Netherlands: CGIAR Research Program on Climate Change, Agriculture and Food Security (CCAFS).